At the end of the Ice Age, The Machine came from the outer space with the purpose to change men into mutants. However, a hero defeated the device and a great seal was laid over The Machine. In 2707, the depleted world is ruled by four Corporations: Mishima, Bauhaus, Capitol and Imperial that are in constant war. During a battle between Capitol and Bauhaus, the great seal is broken and The Machine works again transforming soldiers and civilians in hordes of mutants. A small part of the population escapes to Mars, leaving millions of people behind. The man of faith and leader of an ancient brotherhood Brother Samuel is a believer of God and the Chronicles, a bible about the mutants. 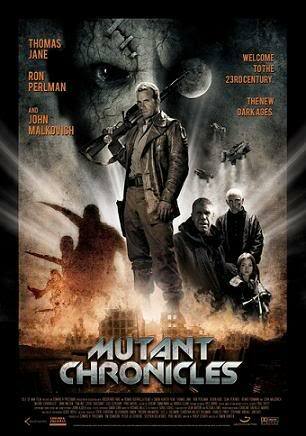 With the city under siege of the mutants, he visits the Corporations' leader Constantine asking for an aircraft and twenty men for a suicide mission to destroy The Machine, planting a bomb and a detonator following the knowledge of the Chronicles. He recruits the tough Major 'Mitch' Hunter; the Bauhaus Lieutenant Maximillian von Steiner; the keeper of the Chronicles Severian that is under a vow of silence; the gorgeous and lethal Corporal Valerie Duval; Corporal Juba Kim Wu; Captain John McGuire; and Corporal Jesus 'El Jesus' de Barrera. Together they become the last hope of Earth against the evil mutants.